After my return from a summer full of racing and travel I took some downtime to enjoy being at home with no where i had to go. 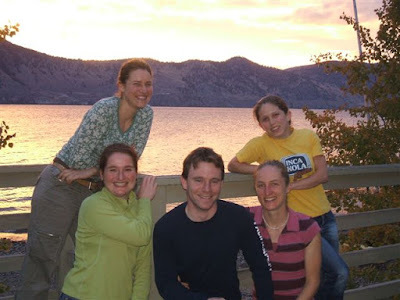 Sandra and i had been excitedly planning a weekend in Naramata (near Penticton) full of pumpkin and biking. Jean Ann, Sandra, Keith, Myself, Jeanine and Sandra's mum convened on their cottage thanksgiving weekend for 3 days of hanging out with great food, friends and trails. We had no tv, phone and cell reception on at the edge of Lake Okanagan which we looked out at from the balcony. We fell asleep to waves lapping against the shoreline. I typically describe cyclocross as all my weaknesses on a bike thrown in to 45 minutes of pain, but by the last 2 laps I seemed to be figuring it out and made my way up to 3rd at the BC Cup. Yeah!! 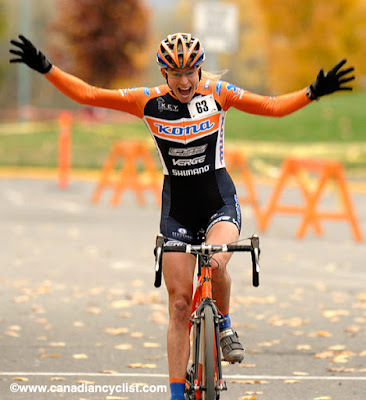 A bike race in Kamloops! Henry Pejril came through again for the cycling community hosting a fantastic weekend of Cyclocross racing. On Saturday October 20th we had our provincials and sunday Nationals. Attendance was great for Nationals and we had 2 Ecstatic National Champions crowned. Nice Ride Wendy. Thats how excited every race winner should be!!!! Wendy Simms outpowered Alison Sydor and Lynne Besette for the title. While Ontario boys Mike Garrigan and Greg Reain distinguished themselves from the rest getting away early. Garrigan overtook the reigning National Champion Reain for the win. Riders all seemed happy with the twisty and fast course. There were a couple grumbles about the lond sand section, but what's a course without a tough challenge? 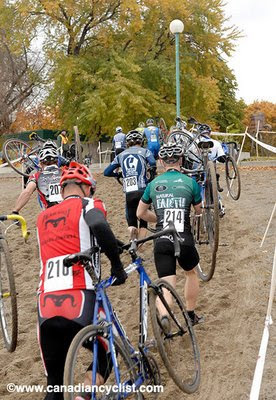 I've seen Euro cross races with way more sand and they gave birth to the sport. Me? Well I had 2 great races. In provincials I lead the chase over Wendy and Lynne finishing 3rd. That gave me the Silver medal as Lynne was from Quebec. Sarah Stewart also like me, coached by elitewave.com earned bronze followed closely by Jean Ann Mckirdy. At Nationals I got called up at the back. This day though I was determined to start better and try to contact the leaders. I was able to move up oodles in the first 2 turns and found myself with Kelly Jones leading the Chase group on leaders Besette, Simms and Sydor. Jean Ann and Mical bridged up and we headed out on lap 2. I miscalculated my speed though and hit a curb while hopping it. When I went to put down a powerful pedal stroke I got the horrible feedback of a flat tire. I stuck with the girls along the straighaway, but couldn't corner quickly with the flat and they pulled away as I drifted back through the field. Team 3 Rox racing helped me out in the pit zone giving me a spare rear wheel. Thanks guys! I'm pretty sure I was dead last at that point and began my fight to the front. I felt awesome and pushed myself hard to move up. It was a blast. I ended up finishing 10th, 1 minute off 4th. Not bad for the time i lost with the flat and traffic so I'm pretty pumped. 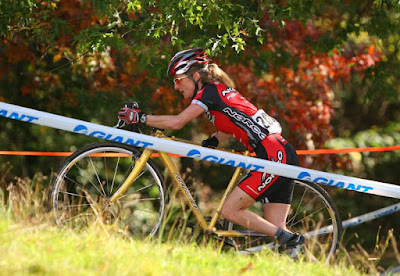 World cups have definitely made me a better cyclocross racer. I know I only have to go that hard for 45 minutes not 2hrs!